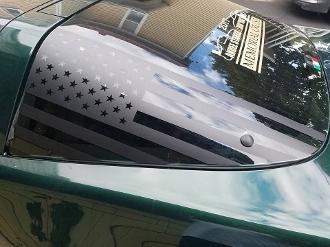 CORVETTE REAR HATCH GLASS AMERICAN FLAG VINYL DECAL SET 84-96 DECAL IS OF HIGH QUALITY VINYL. CHOOSE COLOR. YOU GET 2 DECALS, ONE FOR EACH SIDE. WE SUGGEST THAT YOU HAVE EXPERIENCE WITH LARGE DECAL INSTALLATION TO DO THIS, IF YOU DO NOT, HAVE A PROFESSIONAL DO IT. IT TOOK US AROUND 30 MINUTES TO DO THE INSTALL. WE HIGHLY SUGGEST USING A HEAT GUN TO MAKE SURE THERE ARE NO CREASES AROUND THE CURVES..